Rock up in an "Old Skool" classic that makes an impression and get the "WOW" factor! Do it alone or share it with your friends. 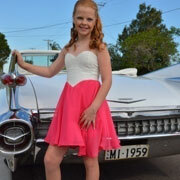 Your School formal is the most exciting social event of the year if you are in year 6, 10 or 12. Apart from your attire the next important thing is the car you arrive in. You can guarantee to make heads turn when the novelty horn sounds and you and your friends cruise by in one of our white 1959 Cadillac convertibles or the one and only White 1959 Cadillac Super Stretch. You'll be an instant celebrity and the paparazzi will be out! Our Cadillac convertible is a great way to be rewarded for your hard work, whether you want all the attention and go alone or with a partner, these classic cars seat up to 5 passengers and the cost is per vehicle not by passengers so why not have fun and all pitch in. Cruise with the top up and drop the roof as you near your formal venue arriving in convertible style and give the "royal wave". Perhaps there is a group of you and you want to make that real VIP entrance, then the limo is the one for you. Create the anticipation as you make your grand entrance, have up to 9 students step out onto the red carpet. All students are picked up from one location. 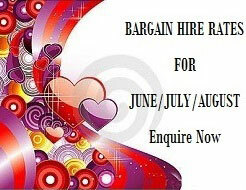 This is where the fun begins and you get to show off your glamorous look and pose utilising the car both inside and out. 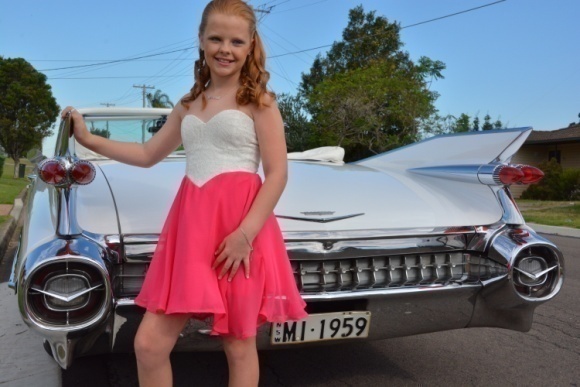 Your formal transport makes for a great prop, your chauffer will help you take the best photos and tell you where to stand for those lifelong memories, parents and neighbours will want to join in to see what all the fuss is about. If you have a well co-ordinated formal some students will have a meeting point (usually a park) on the way to the venue where friends will meet other friends to take photos and check out their wheels. The formal transfer usually takes about an hour from pick up to the grand finale. 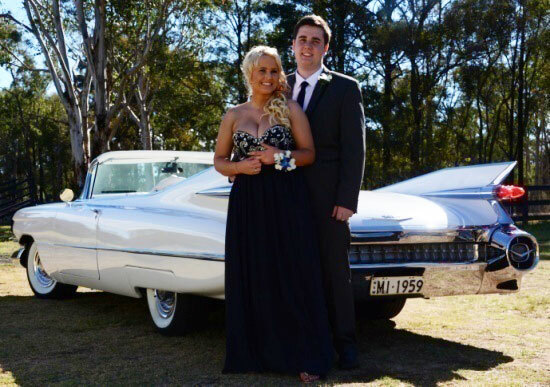 Our classic cars and limousine are available for hire for a whole range of events and occasions in Sydney please complete the online enquiry form for your quote. My husband and I would like to express our sincere thanks to you for making our daughters night a memorable one . From the moment she saw the car her eyes lit up with anticipation for tonight and I know that she totally enjoyed the ride to the venue. On a more personal note we would like to express our sincere thanks to Alan for his professionalism and patience in dealing with our daughter and her friend .